For this Weekend News article, I want to help shine the light on the CCSS Machine in higher education..specifically in the name of college/post-secondary affordability. Who is involved? How does this connect to the CCSS Machine? Above, you see a screen shot of the NC Senate Bill 873. Its short title is the ‘Access to Affordable College Ed Act’. 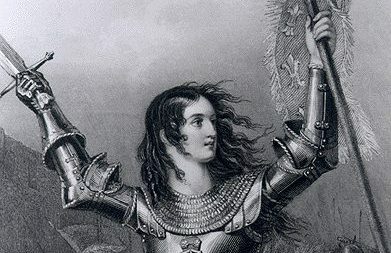 Since you, my fellow anti CCSS Warriors may NOT live in NC, what will your State have in the works for higher education reform where saving money is a selling point? If you have heard any of my more recent interviews, you may recall I have shared that one of the ways in which we, the citizens of the USA, will be taken in by the CCSS Machine’s higher education grasp is through the affordable cost of post-secondary education. Look closely at the above screen shot and you will see the easily identifiable Common Core Machine ties. But trust me, there are MANY more not in black and white print. However, before we get to a State level look, let’s review what the federal level of the CCSS Machine’s education overreach in the name of savings for post-secondary education. Also in Feb. 2016, I dug into the 2017 Fed Ed Budget Requests and found how college and other post-secondary education is to seem more affordable. Early College programs; where funding for HBCUs (Historically Black Colleges and Universities) and MSIs (Minority Serving Institutions) were to be impacted as well. Right slam in the midst of all this is the connection to the SREB (Southern Regional Education Board). How? In the name of ‘research’! If you go back and look at the NC legislation in the works, see how SREB’s research is being relied upon as well as written into the Bill. In the article I also gave you how the funding will impact TRIO programs, Job Development Grants, and more. The article also shows you how each one of these ties back to the ESSA (Every Student Succeeds Act), WIOA (Workforce Innovation and Opportunity Act), as well as HEA (Higher Education Act). Others NOT included in the screen shot include Dr. June Atkinson (head of the NC Dept. of Public Instruction, as well as the President of the CCSSO, Council of Chief State School Officers, which own half the copyright to CC Standards!) and Dr. Scott Ralls, the (at that time) head of NC Community Colleges. Ralls has moved on to become President of a Community College in VA since this report. Now, I know some of my NC anti CCSS Warriors may be shocked to see some of the names they see. My concern is how many of these people have we heard publicly state they were/are against CCSS, but are participating in embedding it in various ways into the State Laws? Do they KNOW the connections already and just turn a blind eye, or has the truth been kept from them?! For those of you NOT in NC, look at your regional boards to see who is in state government AND serves on these types of boards! If you refer back to the top of the article and see the National Student Clearinghouse Research Center, you may not know that this Center is ALSO a CCSS Machine member, but it is!! Furthermore, it is being used as MORE research and evidence to create legislation! So, How Does All of the Above Impact NC Legislation? 1) It further embeds the CCSS Machine, the federally led, privately funded education overreach into the State. Remember, since ALL the States are impacted by the U.S. Dept. of Education, WIOA, ESSA, and HEA, there is NO reason to think NC stands alone in this. 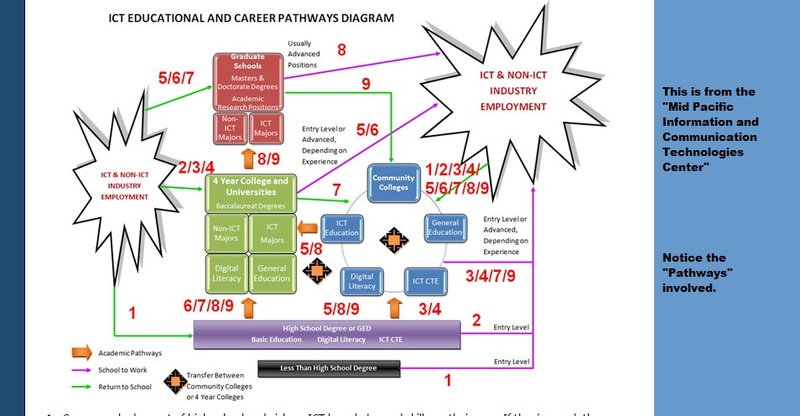 4) In the body of the NC SB873 (Access to Affordable College Ed Act), you will see how by taking 4 year state-led colleges and turning them into community colleges it plays right into the hands of the SREB intent/CCSS Machine agenda to use community colleges as not so much educational facilities, but worker prep facilities. In the NC Legislative Bill screen shot, you may notice I underlined the name of David Kirp. 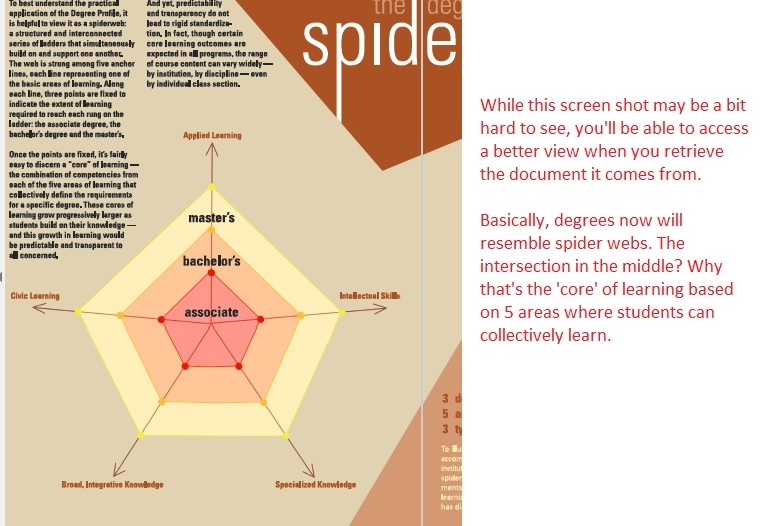 I found this excerpt about him on the Learning Policy Institute’s website (that is where the Sr. Fellowship comes in). The Learning Policy Institute is funded by some pretty big CCSS Machine members (Ford Foundation, the Hewlett Foundation, etc.). The President and CEO of the Learning Policy Institute is none other than Linda Darling-Hammond (a notoriously known CCSS Machine disciple)! AIR was also underlined in the screenshot. American Institutes of Research are also notoriously tied to the CCSS Machine. Many anti CCSS Warriors have shared the ties, the deceptive moves for data mining carried out in the name of ‘research’. One anti CCSS Warrior in particular has mountains of documented evidence on AIR. Her name is Deb Herbage (FL). She has recently begun her own blog, DezignzbyDeb (it is on WordPress, like mine). Contact her for any thing AIR related. As twisted as the CCSS paved road is in each of our States, I trust you can see why legislation, either State created or federally, is being used to continue the vicious cycle of grinding down our nation education-wise. Please, look into your State’s governing bodies. NC residents: PLEASE contact the leaders and DEMAND accountability while you share the truth. Warriors, many of these leaders are seeking to be re-elected. Will we continue to put them in office? What is Congress up to concerning the education/workforce? We’ve seen what they’ve highlighted so far in the “Student Success Act” and the “Every Child Achieves Act”. The HEA hasn’t been talked about much lately, that’s true. However, the CCSS Machine (my reference to the entity that involves and surrounds the “Common Core State Standards”), has plenty of plans. The above image is from Oregon. Does your state have a similar ‘track’ for the aligned “K to Career”? Here’s one from California that is specifically for higher education. At a July 2015 hearing concerning re-authorizing the HEA, members of the HELP heard from the Lumina Foundation, The Higher Learning Commission, and others. Lumina also has ‘profiled’ higher education degrees. 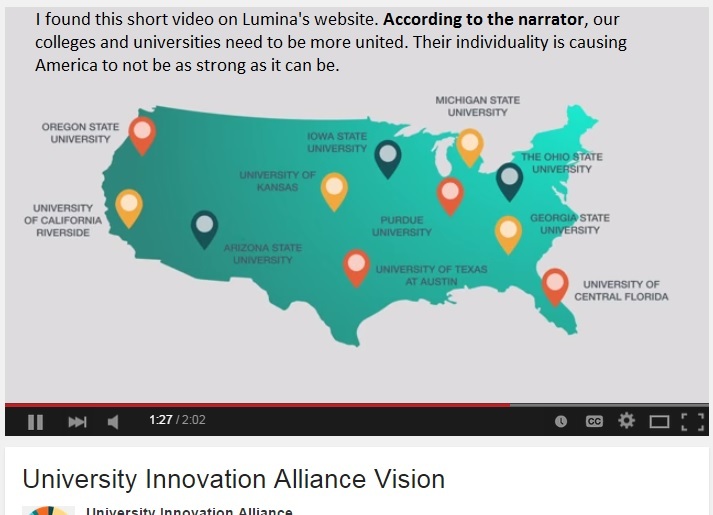 See: https://commoncorediva.wordpress.com/2015/04/22/wybi-ccss-supporter-profiling-higher-ed-degrees/ Embedded in this article is the Lumina Foundation statement for alignment of K-12 to Higher Education. 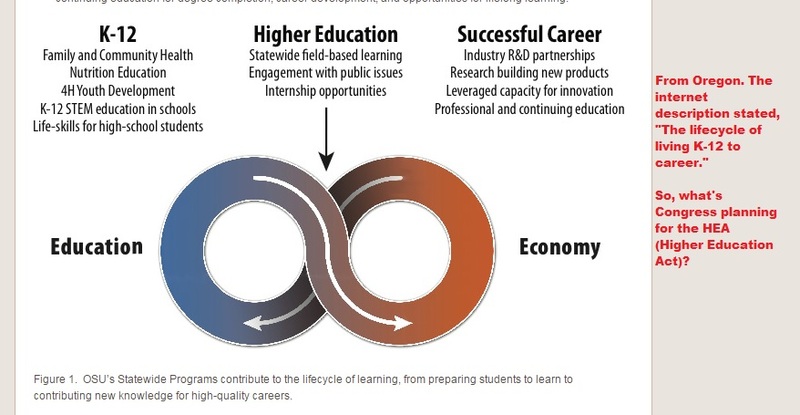 Expect more Competency based education in higher education and the re-authorizing of the Act. Expect MORE CCSS Machine rhetoric for Career Technical versions of the Standards. Expect to see Sen. Lamar Alexander speak in favor of MORE alignment. Lastly, expect this: WE, the opposed to the CCSSI (Common Core State Standards Initiative), WILL NOT STOP FIGHTING!